With the end of daylight savings and as we approach Easter and the school holidays we note the traditional shrinkage in homes being listed for sale. Alongside this we also note an increase in the number of sales as buyers and sellers find a meeting of the minds albeit after a protracted period. These factors together may work in favour of those listing in this early Autumn period. With that in mind, here’s brief article that is worthy of considering if you are looking to sell. I thought this piece by Tony Alexander featured on OneRoof was a great overview of the market - well worth reading. In short, the dynamics of the market place have changed, and are changing. Those vendors that can see that will meet the current market, which may be the reality for some time. The talk of a Capital Gains Tax now appears to be being kicked down the road and potentially watered down. This politically sensitive potential change to the Tax System will no doubt be modified in line with poll reactions. Either way for those buying and selling the family home it will have no impact. You can’t help but wonder if the unintended consequence of a CGT is that more money is invested in the family home rather than a rental investment. The double whammy being house prices increase and rents escalate? Good News - 38% Increase in Sales! We are thrilled to report a 38% increase in our sales numbers in the current financial year, plus a record December. Put those facts alongside the recent headlines and it begs the question – how can that be? In short, UP Real Estate started this business 25 years ago with the specific intention of providing a bespoke focused approach to every listing – we call it ‘Real Estate by Design’. It’s different, incredibly effective and brings with it significant benefits to each of our clients – the facts speak for themselves. In short, if you’re thinking of selling or know someone that is, you should find out how we can help. I’d love to demonstrate the difference. December saw the national median increase by 1.5% from $551,750 in December 2017 to $560,000 in December 2018. Prices for New Zealand excluding Auckland increased by 6.4% to $480,000 up from $451,000 in December 2017. In Auckland, prices rose by 0.2% to $862,000 up from $860,000 in December 2017. Only one region experienced a record median price – the Bay of Plenty with a 2.0% increase taking the median to $610,000 up from $598,000 in December 2017. “Whilst the Bay of Plenty was the only region with a record median price achieved in December, in actual fact it was a strong month from a price perspective as every region in New Zealand saw an annual increase in the median price. The last time all regions saw annual price increases was back in June 2017,” says Norwell. “Additionally, Auckland finished the year in a strong position with the highest price for the region in 9 months at $862,000. Breaking the region down, Auckland City saw an annual increase of 7.8% resulting in the highest median price for the City in six months at $986,000 and Waitakere City had a 6.2% increase to record median price of $828,000. However, on the flip side, North Shore City median prices fell -11.6% to $980,000 and Franklin District saw a fall of -4.2% to $680,000. Auckland Council's chief economist David Norman argues Auckland's housing shortage will prevent Sydney and Melbourne style price falls. The downturn in the Australian housing market is being closely followed on this side of the Tasman, with many people believing Auckland's housing market will follow the Australian market and head into a slump next year. However Auckland Council's chief economist David Norman doesn't think so. In a LinkedIn post, Norman said Auckland's housing market was unlikely to follow trends in Sydney and Melbourne. "Suggestions that the Auckland housing market will follow those of the Australian eastern seaboard seem baseless," he said. "Sydney and Melbourne are in a very different position, having not systematically under-built the way Auckland did, and thus having no significant shortfall. "Auckland's shortfall is around 46,000 dwellings. 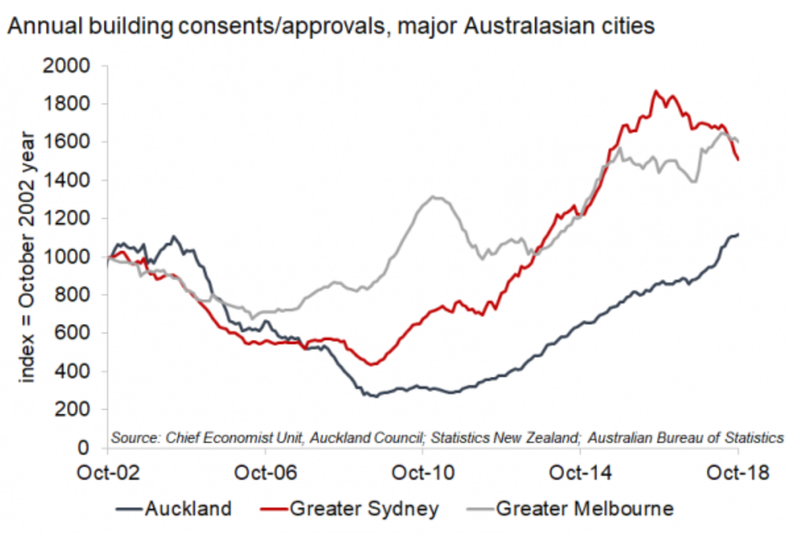 "Our trans-Tasman cousins' two largest cities have an oversupply of apartments, largely the result of building for the foreign investor market that is not as buoyant any more (the way Auckland overbuilt for overseas students in the early 2000s). "This has concerned some of the banks in Australia for years and explains some of their nervousness about lending for apartment projects in NZ. "Hopefully this chart [See below] will dispel some of their fears!" "We need to keep building for a very long time at current rates and faster to eliminate our shortfall," Norman said. Donna and myself wish you and your family the very best for the festive season ahead, be safe, have fun and we look forward to seeing you in 2019!! Ring Fencing - A Solution? INDUSTRY UPDATE: With an OCR on hold and a current interbank mortgage war that is resulting in record low rates, it’s no wonder October numbers just released have resulted in an increase in the number of sales. Alongside this, the Reserve Bank have flagged their intention to review the current Loan to Value Ratios. Currently, banks can only lend 15% to new customers with less than a 20% deposit and 5% of banking to those with less than 35%. Our observation is that in real terms there is no shortage of homes available, rather sales volumes have been and still are limited by bank funding criteria. Consequently, these two factors together should have a positive impact on market sentiment and ultimately activity. The predicted rush of listings pre-Christmas is upon us. As mentioned in previous articles those vendors who put off selling last year post election are now on the market. Just how many ‘meet the current market’ will be interesting to observe. Supply/demand ratios right now look to be favouring buyers in some quarters, consequently given the fact that many buyers are now spoilt for choice, for vendors, it may be a case of first out best dressed this side of Christmas. A note of caution to buyers: beware of indicated or estimated selling price ranges or market value ranges as predicted by algorithms on various websites. In many cases these can be over the likely selling range and in excess of the vendors’ expectation. If you like the look of a house, please inspect. You just can’t underestimate the value of presenting your home well. It’s not just worth money, it’s also worth time. In other words, great presentation helps make your property saleable. It’s difficult to quantify this because we never get to offer the same house in two different states of presentation. However, what we do observe is the impact on buyers. ‘I really like it!’ Is a phrase that describes more than bricks and mortar, selling a home is also very much about selling a feeling. If you’re thinking of selling this year, you should start preparation now. A fresh set of eyes can help – I’m happy to volunteer!